First you will need to register a new freephoneline account. To do so, please click on the "register now" button and follow the registration instructions. Registration is fast and easy and it will take you just a couple of minutes to finish the whole process. After registration you will receive an email with a pin code for activation of your account. You will need to login with your new account login information, click on the "call me now" button, and our system will call the phone number you entered at registration, then you enter your pin code you received by email to activate your account. Please keep in mind that the email and password entered will be used for login account information but also to use the Freephoneline desktop phone. Note: Highspeed Internet is required for this service. Download our Freephoneline desktop phone application from this site. 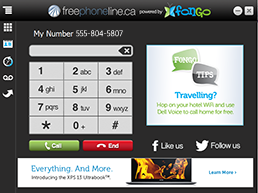 Freephoneline.ca, by Fongo, is a completely free, media-based softphoneline application that allows users to convert their computer into a fully functioning home phone line. Unlike other VOIP solutions, freephoneline.ca users are assigned a real phone number that allows them to place and receive calls, make free of charge long distance calls to most cities within Canada, access enhanced voice mail, make a 911 call in an emergency, and forward their calls to another phone after the application is shut down. Freephoneline.ca offers today's mobile consumer, traveler and virtual worker complete communications portability.